Before the player starts his backswing, he is basically standing upright, with shoulders level and chest facing forward toward the target. As the player begins his backswing, he leans forward slightly— this allows for a higher backswing. His throwing shoulder drops a little and moves backward, causing his torso to twist backward slightly. 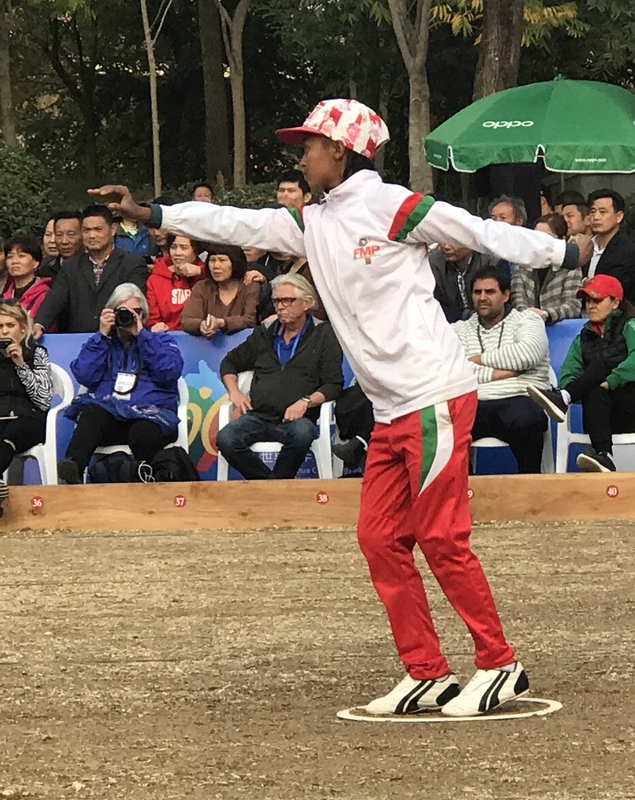 At the same time, his non-throwing arm starts to move backward so that at the height of the backswing both arms are raised behind his back, balancing each other. 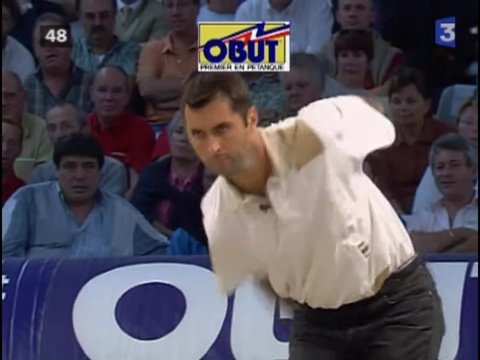 Here is a sequence of clips from the Youtube video of Ledantec shooting during the final of the Masters de Petanque 2004. Continuing backswing. Player leans forward slightly. Non-throwing arm starts to swing back. Approaching full backswing. Non-throwing arm is as high a throwing arm. At the height of the backswing and just beginning the swing. The throwing shoulder is just starting to drop lower than the non-throwing shoulder. Throwing shoulder approaches bottom of U-shaped dip. Note the angled slope of the shoulders. Torso has started to untwist. Note that the non-throwing arm has continued to move backward, balancing the throw. Almost ready to release the boule. Torso is almost fully untwisted as throwing shoulder moves forward. Release of the boule. Throwing shoulder is starting to rise after the lowest point of the U-shaped dip. Note that the non-throwing arm remains behind the back, counter-balancing the throwing arm which is now in front of the body. After release. Torso is fully untwisted. Throwing shoulder is almost finished rising at the end of the U-shaped dip. Here is the whole sequence as a slideshow. Almost all of the great shooters (to a greater or lesser degree) demonstrate this ideal form of torso torque. And you will see it (again, to a greater or lesser degree) in pointers as well as in shooters. Why do players move this way when they throw? Byron Putman calls it “torso torque” because he thinks it is a way for a player to use torso rotation to add power to his throw. Personally, I find that the motion of my body is more natural, and my accuracy is greater, when I twist my torso and bring my throwing arm forward while throwing. I suspect that shoulder anatomy is coming into play here, but I don’t know enough anatomy to be able to say exactly what is happening. Note that when referring to a player (of unspecified gender), I use “he” and “his” as abbreviations for “he or she” and “his or her”.